This is real rain, real life. It’s a particularly beautiful deluge. The young cherries have shed their ballet-pink petals in a skirt around their grassy roots. 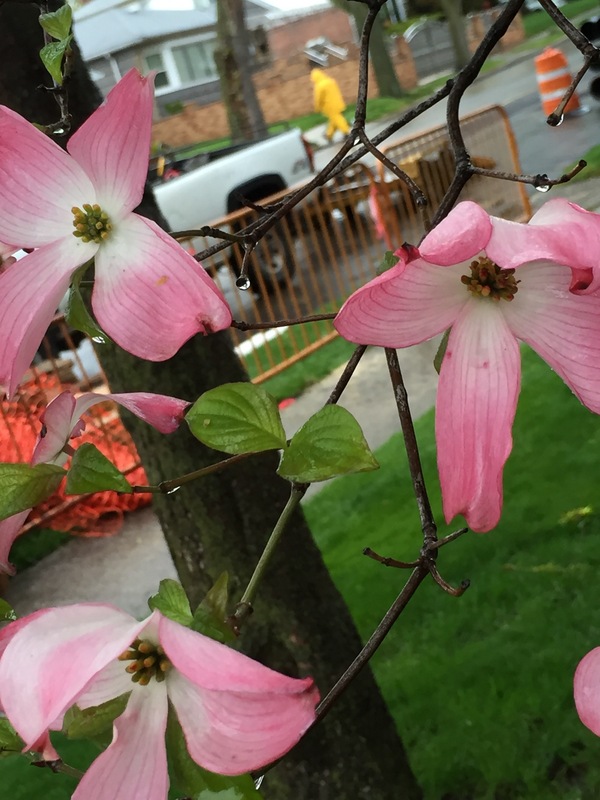 The sassier pink of the dogwood blossoms shines against the low gray sky. Banks of azaleas adorn the sedate streets of Fresh Meadows, Queens. I’m hiding from the drops temporarily in my car, where I have a good vantage on men laying pipe for a new water main. It’s a cold rain, and the chill magnifies the lucid gorgeousness of this spring morning. The workers have labored under wet conditions many times before. A friend with relatives in construction told me that on rainy days they crowed “tavern skies!” before ducking into the bars. I don’t see much work stoppage though–the crews I’ve been with hit it rain or shine. Maybe those were different days. “The water is wet!” says a big guy named Juan, today, and he is roundly ribbed by the foreman. I don’t see anyone complaining. Work proceeds. I am cold just watching it, cold from having ventured out suggesting to the foreman that he erect a tree guard around a delicate specimen that has a pile of heavy black pipe piled at its feet. Trying to make something happen in the world. No, he’d prefer to have his guys doing other things. He’s got the tougher job of getting those pipes put into the ground (and it has to be foolproof, they can’t leak). But for me to be in the world in the rain is new. Writing, sitting at my dry desk, hands on the computer, my feet lodged warmly in their slippers, I would put together words about rain. Characters might meet in the rain, take their leave in the rain. Kiss in the rain. It might pour outside my window over the marsh, I’d see the reeds bend their feathery heads, but no storms for me, I didn’t feel a thing. Didn’t really see the new green. Just the excitement of creating the storm, making it rain on the page. Now I go home shivering, chilled through my thin raincoat. 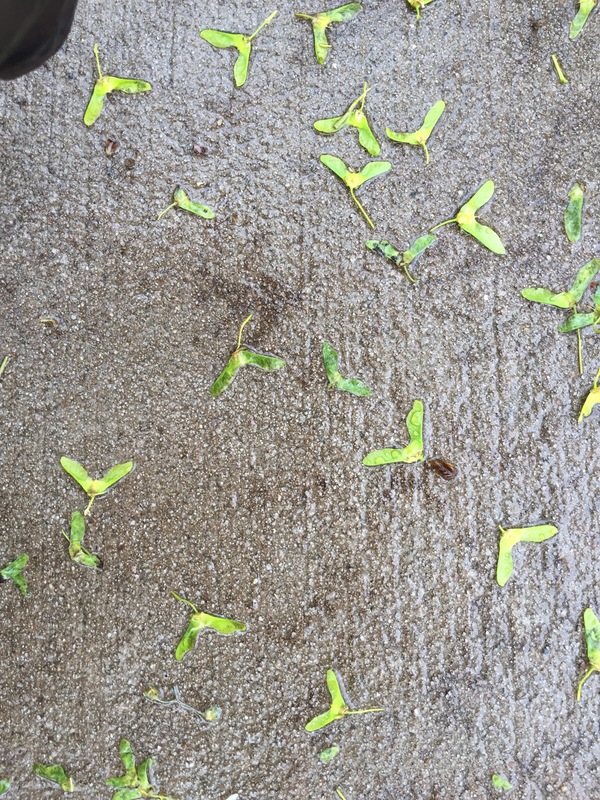 Do you know what a just-hatched oak leaf looks like? Fingernail sized, fragile and the softest of greens. It will grow up to be strong and tough, but for now it’s a pretty baby. You can see them if you come out, eyes open, to work in the chilly spring rain. Jean one of your most poetic and power recent bogs. The maple helicopters are called samaras, and that’s how they float their seeds about, a secondary purpose to wearing them on your nose.